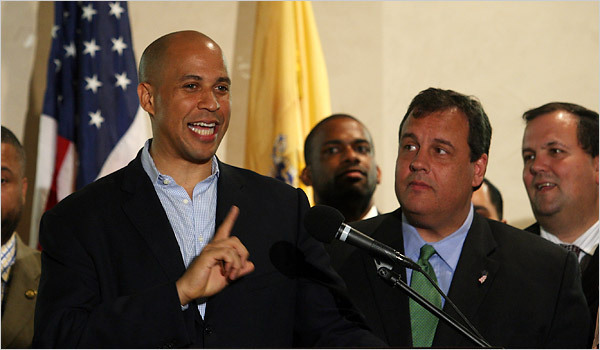 Newark Mayor Cory Booker, caught many off guard when he recently formed his political action committee, CoryPAC. This formation leads many to believe that Booker, intends to seek a higher office. There were speculations he might consider a US Senate run for New Jersey and as of Thursday, he has ruled this out. Booker is a natural-born leader, who on a national stage has shown the country what an elected official is supposed to do - put the constituents first, at all times. He constantly engages with the citizens of Newark; hosting a monthly radio show, open hours at City Hall and utilizing social media to hear about issues, concerns and complaints from residents. I personally follow the Mayor's Twitter feed and he spends most of his free time from City Hall, attending events around the city and promoting local businesses. When outside of Newark, Mayor Booker uses his time to let people know about the city's transformation and his vision for its future. This past January as the city came to a stand still buried under snow, Booker used his Twitter account and Facebook page to track Newark residents in need. He made national headlines when a resident's daughter tweeted that her 65-year old father was in need of help shoveling his driveway. Mayor Booker connected with her and showed up at the residents home and personally helped him shovel the snow from his property. Booker also helped other residents dig their cars out and clear their sidewalks. Booker, only a Mayor, did all of this while the state's Governor stayed on a family vacation in Florida and refused to cut his vacation short and return to New Jersey. Mayor Booker has catapulted Newark onto a national stage, in a positive light. Since Booker took office in 2006, he has attracted private funding from the likes of Jon Bon Jovi, Oprah Winfrey and Conan O'Brien. In 2010 Mark Zuckerberg CEO and Founder of Facebook, donated $100M to Newark Public Schools. I can guarantee, if Cory Booker were not the Mayor of Newark, none of this private money would be pumped into the city. Granted, I don't live in Newark, I've spoken to people closely associated with the city who take issue with some of Booker's policy decisions and I can understand their grievance. We have an obligation and duty to hold our elected officials accountable. However, there is a difference between holding the Mayor accountable and acting out against your own best interest. I don't understand why there are residents who unfairly target this Mayor and discredit his leadership. These residents do NOTHING to make Newark a better place. Mayor Booker has a direct connection to the White House, has the capability to raise private funds and knows how to reach across party lines to get things accomplished. With all of the good that this Mayor has done for Newark, NJ, there are a select group of people in Newark who despise the Mayor and his work thus far - supporters of Former Mayor, Sharpe James. Just to be clear, Sharpe James is a convicted felon who robbed the city blind. James served as Mayor from 1986 until 2006. He simultaneously served as New Jersey State Senator from 1999-2006, deciding not to seek reelection in 2007. In 2008 James was convicted of fraud; he conspired to sell city lots at an undervalued rate to his mistress and have her resell them above market to turn a profit. Sharpe James attempted to take food off the dinner table of his residents. James held two jobs, attempted to steal from the city, and there is a large group of residents who still support him and want to see him back in office.These people rally against Mayor Booker every chance they get. They obviously don't see the bigger picture. Former Police Director Gary McCarthy was a target of these attacks and jumped ship in May when newly elected Mayor Rahm Emanuel offered him the top job in Chicago. The Anti-Booker coalition of residents in Newark wants to dismantle the Booker team and run them out of Newark. For some reason they think their city would be better off without Booker. He was successfully elected in 2006 and reelected in 2010. Newark has a population of about 227,000 residents, yet only 36,365 residents voted in Booker's 2010 election, providing him 21,397 votes. Less than 10% of the entire city supports this Mayor. So be it! Booker has too much skill and talent to stick with a city that doesn't truly appreciate him. Quite frankly Newark doesn't deserve Cory Booker! If Newarker's can't see the bigger picture and don't want to see Newark reach its true potential, then it's time for Mayor Booker to move on. I would like to see Cory Booker defeat current Governor Chris Christie in 2013, turn the state around, and eventually run for President around 2024. Cory Booker would have a bigger platform and larger base of support, allowing him make greater impact. Does Newark deserve Cory Booker? Has your perception of Newark changed over the years? Is Cory Booker responsible for Newark's transformation? Would you support Booker in a Presidential Primary?